Punxsutawney Phil, otherwise known as the “Seer of Seers, Sage of Sages, Prognosticator of Prognosticators and Weather Prophet Extraordinary” is perhaps America’s most famous groundhog. Phil hails from Punxsutawney, Penn. and he has one job on one day every year – forecasting winter weather on what has become known as Groundhog Day. Did you know the history of Groundhog Day is rooted in Native American culture? The town of Punxsutawney was originally settled and inhabited by the Lenni-Lenape Indians (“the Original People”) for thousands of years, and the town’s name is derived from its traditional name Ponsutenink, meaning “Town of the Ponkis” (Ponki meaning sand fly). Each summer since then, club members return to the area known as Gobbler’s Knob to partake in a ceremony in which Phil is given a secret elixir to prolong his life and youthful good looks. Phil is rumored to be “immortal” and now about 132 years old. For more than a century, Phil has come out of his burrow to check how winter is going and more precisely when winter will end. As legend has it, if Phil sees his shadow, winter will last another six weeks; if not, we will see an early spring. 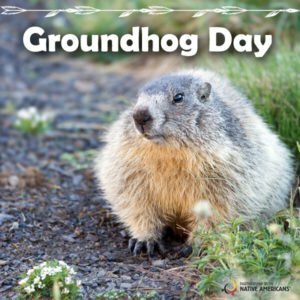 As for the groundhog himself, he’s also known as ‘woodchuck’, possibly derived from the Algonquian word ‘wuchak’, the Narragansett word ‘ockqutchaun’ and/or the Cree word ‘otcheck’ (a member of the weasel family).The Wabanaki people even have Grandmother Woodchuck in their legends who teaches patience and wisdom. This year, Phil’s predictions mean we’re in for an early spring. Personally, I was hoping for the cool spring breeze and escape from this winter’s howling cold in South Dakota! This entry was posted in Humanitarian and tagged Groundhog Day, Lenni-Lenape, Native American, Punxsutawney, Punxsutawney Phil. Bookmark the permalink. Trackbacks are closed, but you can post a comment.